National Parenting Gifted Children Week is hosted by SENG (Supporting Emotional Needs of the Gifted). Download SENG’s free NPGC Week ebook, The Joy and the Challenge: Parenting Gifted Children. The point of “Grandma Says It’s Good to Be Smart” is that for many gifted kids, the teenage years are too late for this message. That is why they don’t believe it. Grandma says start telling them that it’s good/cool to be smart early on. Starting in infancy and toddlerhood, smart and gifted children need to feel good about their abilities and have that message reinforced every time an unfortunate incident of name-calling, bullying, or negative peer pressure to hide who they are and what they know occurs. In honor of SENG’s National Parenting Gifted Children Week, I am offering a special price for “Grandma Says It’s Good to Be Smart.” Start your little ones on a path to believing in themselves and their talents at an early age. Go to the “Contact Ellie Books” page of www.allkindsofsmart.com for details on how to order. Eric Heidin, Olympic skater and gold-medalist, once remarked that it all began because someone gave him some skates. This is an apt metaphor for advocacy. Someone must provide the skates. But Eric received more than that. Advocacy for him meant also receiving an arena, a coach, time for practice, competition, guidance, caring when he struggled and lost, and pride when he achieved and won. It means the same for all children with talents, whatever the field of endeavor. They must be given the materials and the tools for learning. They need someone who can feed their passions and guide them through the hard work and determination it takes to succeed. They need to stretch their limits and be respected for their goals and accomplishments. Advocacy for talent development is advocacy for excellence, whatever the domain. Advocacy for appropriate educational options is essential along every person’s road to success and happiness. In the literature on talent development, Peggy Dettmer (1991, p. 170) presents stages of advocacy that she believes can help parents and teachers become more effective in bringing about educational change. Attention is the first stage, because if you are going to make a difference, you must first gain the attention of key people in whatever constituency you need to affect. After attention, the interest you’ve roused in the situation invites participation by those you need to assist you. Their concern for the students you’re trying to help should follow. Those who are concerned should be ready to get involved with your situation. As they grow in knowledge they should become more willing to make adjustments to the curriculum, policy, or program. This leads to their commitment and puts them in a position to provide encouragement for others to support your efforts. They will be able to help you promote an optimal match between learner characteristics and curriculum or program. Finally comes resolve to make the change successful, perseverance to see that this is accomplished, and progress toward realizing the educational goals you had in mind. Dettmer suggests that as your children go through school, you will need to cycle through the stages again and again at increasingly sophisticated levels. These descriptors need not occur in any set order. You might or might not experience them as stages. Chances are your advocacy will require you to work at increasingly complex levels, but you might simply consider these helpful key words that inform your thoughts, feelings, and actions as you guide your child’s talent development. “Grandma Says It’s Good to Be Smart” can help you to start advocating at the basic levels for your smart and talented children when they are preschoolers or in the early grades. In honor of National Gifted Education Week from July 17-23, I will offer a special sale of the book throughout July. See the Contact Ellie Books page of this blog for details. Did you know that 1 in 4 adults did not read a book in the past year? Worse yet, 50% of adults are unable to read an 8th grade level book. According to the 2003 National Assessment of Educational Progress (NAEP), 37% of 4th graders and 26% of 8th graders cannot read at a basic level. Reading statistics are grim. Children learn to read by example. If they see you reading, they will want to read too. 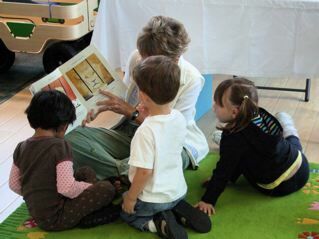 Reading to infants establishes a pattern, or habit of reading. Soon, they will be able to read to you. They can then be introduced to more complex literature if someone simply helps in selecting books they can understand and discuss but not tackle alone. By the teenage years or even earlier, students’ growth should start signaling that the oral reading years are coming to an end. As a parent, when that happened I independently read books that my sons recommended to me. Thus we continued to discuss concepts, share ideas and feelings, and enjoy reading ‘together’ until they left the nest. In fact, we still share titles, give each other books as gifts, and discuss mutually-read books today. The modeling experience involves doing many things together—reading, talking, listening, exploring, thinking, wondering, laughing, and even crying together. 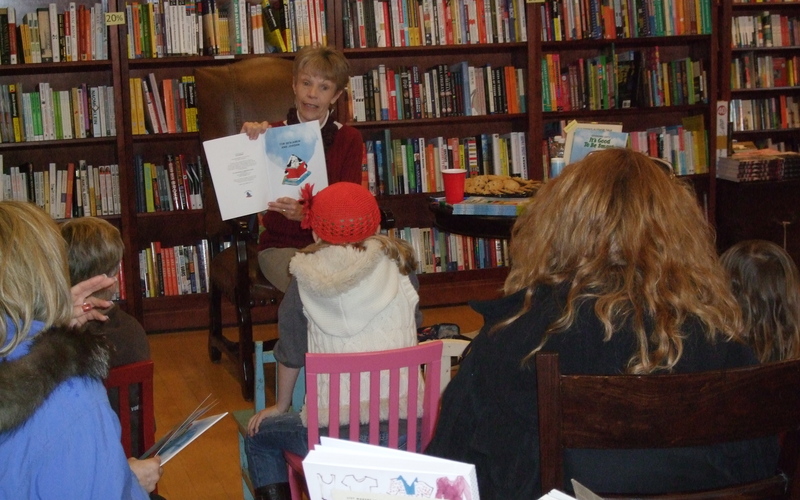 An interest in books may be encouraged through regular visits to the public library. Some smart children have an inherent respect for books from infancy on. Others need to learn this respect through careful instruction on how to treat a book. You will recognize your child’s natural tendencies and thus be able to guide him or her according to individual needs. Little children develop responsibility, as well as awe for storytelling and knowledge acquisition, by picking out their own books, taking them home, reading them (with and without you), learning to treat them with care, and returning them for another set of tales and experiences. Although books may be attained at no cost through the library, it is good for the blossoming reader to start developing a personal library as well. Children’s books vary in expense. Books can be purchased at garage sales, book swaps, and used bookstores at a very small cost compared to the value of the investment. The possession of some books that can be called ‘all mine’ brings deep pride and satisfaction. Among the loves of our lives are our little ones, in my case my grandchildren. This special is for those of you who want to give the gift of talking, reading, and thinking to your grandchildren (or children) this Valentine’s Day. I will hold copies at a special price of $7.50 through Valentine’s Day. 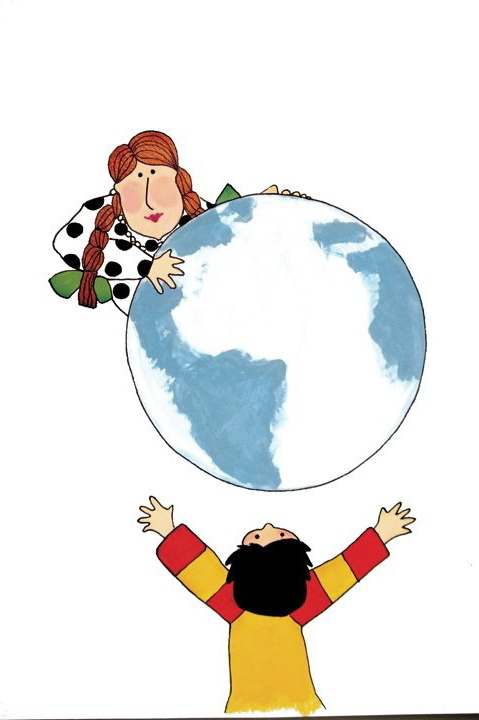 Let us “toss them the world” together. Sorry, not much I can do about shipping – that remains the same. Contact me with your order per the instructions on the “Contact Ellie” page. Happy February and Valentine’s Day. Can Your Child Read a Menu? 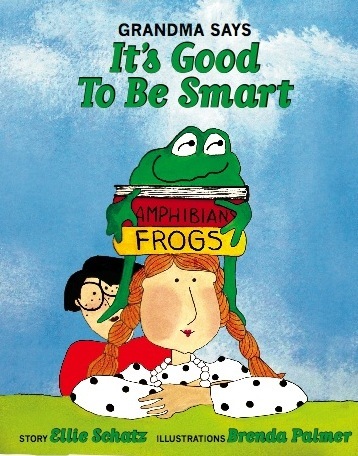 Grandma Says It’s Good to Be Smart is currently being reprinted. Having sold 800 copies in the first year, some of them to community centers that serve poor families and provide educational resources to the children, my goal for this third printing is to reach more poor children in Madison, Milwaukee, and other communities. Talking about the text and the whimsical illustrations will encourage not only reading, but also questioning, imagining, and dreaming as well as vocabulary building. Talking is a skill not discussed in the book but one that precedes reading in the developmental process. For poor children, a structured reading setting will introduce vocabulary that they otherwise might not hear at this critical stage of learning. Statistics demonstrate that by age 3, children talk as much, but only as much, as their parents. These same studies point out that while professionals talk an average of 3,000 words per hour with their children, welfare families talk an average of 500 words per hour, with most of those words being in the form of commands. Michelle Rhee states in the film that 3 good teachers in a row can change the trajectory of development for a poor child. I agree that excellent teachers can have a profound impact. That is what WCATY was all about from day one – 20 years ago! But, starting in kindergarten or first grade is too late and too little. The earlier they talk, the earlier they read, and the earlier they come to realize that there are high expectations for their achievement, the better our children’s chances for success. Let’s join Howard Fuller in addressing the issue of not only welcoming the children to the lunch counter, but assuring they can read the menu. Several of you asked that I extend the offer of buy one, get half off the second Grandma Says It’s Good to Be Smart. For two reasons, I will continue that Grandparent’s Day special through September 30. First, it’s because you asked. Second, it’s because I care about learning and now, as school starts, is a great time to support it in a special way. In July, David Brooks wrote a column in The New York Times regarding the value of books to disadvantaged children versus the advantages of participating in an Internet/games-based culture. Researchers from the University of Tennessee showed that children who read just 12 books over the summer did just as well upon the return to school as they would have had they attended summer school. Research from 27 countries showed that kids who grew up in homes with 500 or more books in them did better in school and stayed in school longer than children from families with fewer books. The final conclusion, though, was that the real debate was not books versus Internet, but how to build an Internet-based culture that would attract people to serious learning. My concern is about serious learning. My concern is about giving positive reinforcement to children who engage in serious learning. To use a cliché, it takes a village to raise a child. Grandmas are key players in the village structure. For my “Start of the 2010-1011 School Year Special,” please still go to the “Contact Ellie Books” page for order details. And, buy one book for $10, with the second – for another child in the family or community – being just $5 through September 30. "What if you were the lion in the zoo?"